Bullfrog are the largest species of frogs in Canada and it’s not only huge, it’s an agressive predator in the ponds, swamps, lakes and other humid habitat where the bullfrog is usually found. Bullfrogs are members of the Ranidae familly or true frogs and grow up to 15cm althought they have been specimens reported going up to 20cm. They can live for more then 10 years. It’s common name of bullfrog comes from sound of the loud call that bullfrogs produce. These aquatic frogs are predating of other frog, small fish and mammal and they are reports of bull frog eating smal birds. In Canada, bullfrogs populations are distributed in a large part of the country : southern Quebec, southwestern Ontario, New Brunswick, Nova Scotia and in the extreme southwest mainland of British Columbia. 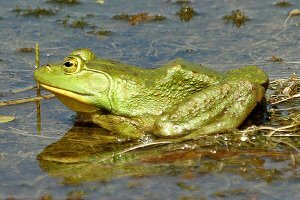 The bullfrog populations in Canada have been decreasing rapidely due mostly to pollution of the environment and habitat loss in regards with human activities and urban developement. The breedin period begins in late spring or early summer. Males defend there territoris and call loudely in the night to attract females into their territory to mate. The Bullfrog call is reminiscent of the roar of a bull, and is easy to distinguish for the amateur. A female may produce up to 20000 eggs that hatch in three to five days..